When a new culture comes into a land, those of the old culture feel uncomfortable, because this new culture is strange and different to their own. They feel fear. That fear turns into hatred. The obvious current example is the fear of those of Islamic religion. By expressing that hatred and anger at Islamic people (or any minority group) you make them feel unwanted in our country and that they are not allowed to be part of our country and our culture. They are then forced to live only within their own culture. They also feel fear, from your unwelcoming attitude, and they resort to finding solace within their own culture – because that is the only one you are allowing them to be part of – to help deal with that fear. In time this fear can also turn to anger and will be expressed against those who have not welcomed them into this country. And that leads to “radicalisation”, and racial violence against you; the very thing you feared in the first place. The irony is, if you show acceptance and interest in their culture, then they will feel accepted in our country, be peaceful and nice, and are more likely to adapt to our culture. 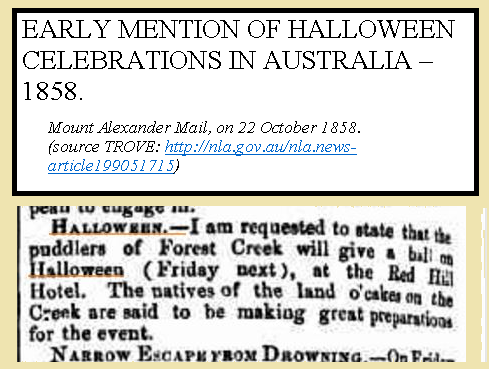 EARLY MENTION OF HALLOWEEN CELEBRATIONS IN AUSTRALIA – 1858. My son reminded me recently that it is Halloween soon (yes, it is today). He doesn’t want the trick or treating or the scary monster stuff, he just enjoys have a little celebration to mark Spring and that school will be over soon and Xmas and the long summer holidays will be coming. We don’t have any formal spring celebration here (since Easter is the true ‘spring’ celebration, but for us it is in autumn). So Halloween is a good one for it. So many of the older generation seem to begrudge our kids – and young adults – the right to enjoy Halloween. They are just showing their age. We didn’t have it, so why should our kids have it? Huh? Why not? Our younger generation have been doing it since at least the early 2000s, probably since the 1990s. So they have grown up doing it, so for them it is now part of their everyday way of life in this country, ie, it IS Australian for them. They aren’t doing it because of all the advertising in the shops, they are doing it most likely because of our modern global village world and with the internet they see so much of it that they want to do it too. And why can’t they? The only reason ever given is, ‘because it is American.’ Huh? What sort of reason is that? Sounds like prejudice to me. Oh, it’s American = bad. Funny how it is prejudice if you criticize any other culture, but they seem to think it isn’t prejudice when you criticise something because “it is American”. And as for it not coming over with the first fleet … well, don’t know about that. It is an old Scottish tradition so would have come over here with any Scots, and there are mentions of it in colonial newspapers. Here is an example of an early Halloween celebration held in Victoria – in Mount Alexander Mail, on 22 October 1858. As I said, Halloween is an old Scottish tradition (how did it get to American? It isn’t an American Native tradition) and it is based on an old pagan Celtic tradition – Samhain. But even apart from all that – why can’t we celebrate it in Australia? Huh? If we want to we can. That doesn’t mean we HAVE to if we don’t want to, it just means, if people think it is fun, why not go for it?